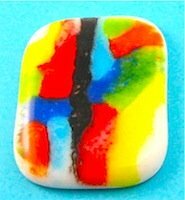 Fusing a high fired glass pendant at high temperature with colored frit powder to create an abstract design. The piece is taken up to a high temperature to create the color variations seen on the pendant. High temperature causes color shifts and the colors to run. Care needs to be taken with this process to ensure the kiln does not overheat. The glass should be monitored, as bubbles just below the surface will sometimes appear at high temperature. This painted pendant has been colored using some of the techniques found on the glass powder painting page. High fired items can be made in a variety of shapes and colors. System 96 products have been used for this project. White glass has been used for the pendant but other colors can be used to deepen the powder colors. Clear or transparent colored glasses can also be used to create very original designs. The paint techniques used can be modified to suit you tastes, the powder for this pendant was applied with cocktail sticks. Mixed powder can be applied from small squeeze bottles and swirled on the surface with a paint brush. Patterns and colors are unlimited. Mixing various powder colors gives you the ability to create your own individual color palette. Two pieces of fusing glass. Aloe Vera or medium for mixing. Step 1. Cut two pieces of glass to the desired shape and size. Cut the top piece slightly larger so that it will fuse over the top of the bottom layer. Step 2.Wearing your face mask, mix the powder, water and aloe gel as per the instructions given for powder painting. Step 3. Follow the painting instructions and paint the top layer. Step 4. Allow the pendant to dry completely. Step 5. Stack painted layer on top of bottom layer, place on kiln shelf and put in kiln. Step 6. Bring fusing temperature up gradually to 1600° F(870° C), hold for 15 minutes. Monitors as the temperature increases, if the desired outcome is reached before the top temperature is recorded switch the fusing kiln off. Do not allow kiln to overheat. Step 7. Allow to cool to room temperature and remove pendant from kiln. Apply bail of your choice to rear of pendant with two part epoxy adhesive. Item may be drilled to accept jewelry jump ring.